Jazz musicians are real American heroes: but their true stories have not been truly told. Find out how they created an original American art form while battling discrimination, poverty, violence, even defying death, to create an original music of the American people. Jazz is America’s greatest gift to World Culture! The jazz heroes in this series have something in common with each other; they have given to the world a wonderful legacy of music. For decades; all over the planet, people continue to read about their lives, study, sing, play, dance to and enjoy their music. These super heroes have provided the soundtrack to our lives; their music is constantly around us. It can be heard everywhere; on elevators, in department stores, on the radio, on TV commercials and movie soundtracks. Because their music is around us all the time, it will be surprising to a lot of young people to learn what these heroes went through in order to accomplish what they did! 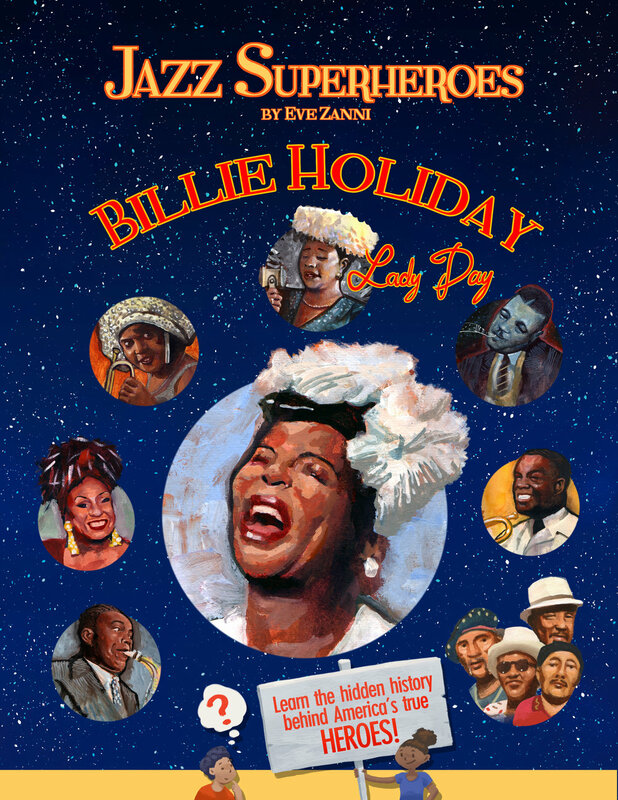 Each of these real life heroes, in spite of the terrible conditions they experienced, triumphed over dangerous and depressing situations and found the inner strength and concentration to learn jazz music so well, that they could make it up their own way and start exciting new styles for audiences to appreciate. This is why they are Jazz Superheroes! Jazz musicians are real American heroes: but their true stories have not been told. Find out how they created an original American art form while battling discrimination, poverty, violence, even defying death, to create an original music of the American people. Jazz is America's greatest gift to World Culture! Most mysterious, original and influential jazz musician of all time: Lester Young was an innovator in music, language, fashion style, attitude! His playing was emotional, humorous, expressive and swinging-beyond-measure! Lester's horn really 'sang' like a vocalist, his musical concepts were the most modern and advanced of his time; paving the way for the more contemporary bebop and avant garde styles to come.